From reptile and amphibian fiestas to the Canberra District Wine Harvest Festival, there’s something to satisfy everyone this weekend in Canberra. Let us know your plans in the comments below – and enjoy the rest of the four-day working week! Work off those Easter chocolates with a free outdoor workout lead by local fitness trainer Lee Campbell at Crace fitness station (off Narden Street) on Saturday at 11am. See a great big helping of roller derby action in Canberra on Saturday 11 April at Southern Cross Basketball Stadium in Tuggeranong from 3pm. Alternatively, pack your running shoes for the Canberra Marathon, which kicks off at 7.45am on Sunday morning. Registrations are still open, but you’ll need to be quick (haha…). If watching other people play sport is more your thing, head to Startrack Stadium on Saturday afternoon to see the Giants play Melbourne at 2pm. Alternatively, the Raiders take on the Melbourne Storm in round six of the competition at GIO Stadium on Sunday at 2pm. The National Youth Week Expo is on at Garema Place on Friday from 4pm to 8pm. Hosted by the Youth Coalition of the ACT, it features young performers, artists and musicians; youth and community service stalls, competitions and lots of activities. Celebrate Slow Art Day (a global event that aims to get more people to discover the joy of loving art) by taking a long look at selected portraits in the National Portrait Gallery’s collection, then meeting to share your thoughts and observations. Canberra Slow Art Day runs from 2pm to 4pm on Saturday. Bookings essential. Grammy Award-winner Leo Sayer plays at the Canberra Theatre on Friday evening. Odd Mob (the duo that brought you Is it a Banger) will perform at Mr Wolf on Friday night from 9pm. Tickets $10 before 10pm, more after. The Shane Pacey Trio play at the Harmonie German Club on Saturday from 8pm. Moochers Inc. and New Gods of Thunder play at The Phoenix on Saturday night from 9pm. Mike Oldfield’s Tubular Bells will be performed by just two musicians (the original masterpiece required over 30 musicians) in Tubular Bells for Two, which has sessions all weekend at The Street Theatre. The Hustle and Scout Twilight Markets run from 2pm to 7pm on Saturday at Hangar #47. With over 60 independent fashion designers and collectors, three live music acts, 30 food and drink stalls by The Forage and workshops by the Makers’ Collective. The Jane Austen Festival runs from Thursday to Sunday at Albert Hall. Find out how to tie a cravat, attend the Battle of Waterloo Ball or enjoy period games and horse and carriage rides at Lennox Gardens. The Canberra and Region Heritage Festival, which raises awareness to the need to conserve the region’s natural, historic and Aboriginal heritage, starts on Saturday and runs until 26 April. The Canberra District Wine Harvest Festival runs for this weekend only. There are over 20 cellar doors and cafes open, and Autumn is the time to see the vineyards at their best. The Old Canberra Inn’s Rockabilly Relaunch runs from 11am on Saturday, featuring live music from bands including The Fuelers, The King Hits, Bad Luck Kitty and The Groove Kings. There will also be retro markets, free-range pork belly rolls fresh from the spit and a kids zone. Canberra Reptile Zoo in Gold Creek will this Sunday host Canberra’s first reptile and amphibian fiesta. Bring your scaly pets, attend information talks or just enjoy a sausage sizzle and unusual creatures on display. Learn the art of cheese making from self-confessed cheese man, Gurkan Yeniceri at the Canberra Environment Centre on Saturday from 11am. You’ll leave with your very own lump of blue vein cheese, printed notes and a belly full of wine, cheese and bread. Celebrate Gungahlin is happening on Saturday 11 April, 2015 at Gungahlin Town Park, corner of Gozzard and Hibberson St Gungahlin. On Sunday, bring your rainbow chalk to the Queen Elizabeth Terrace (in front of the National Gallery, on the water) to chalk one up for LGBTQI equality as part of DIY Rainbow Day Canberra. Arrive from 11am for fun, frivolity and what organisers describe as ‘whimsical activism’. Have a good weekend! What have we missed? 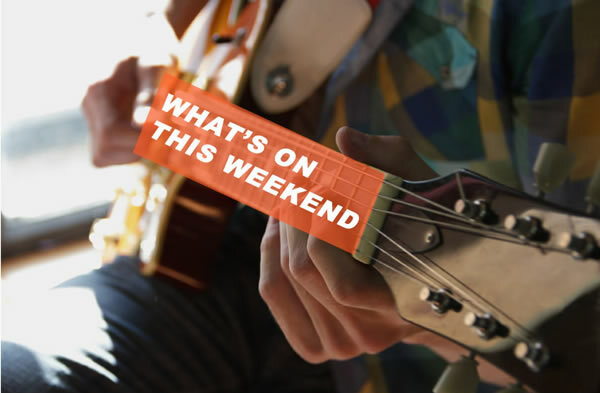 Tags 11th and 12th april 2015 What's on this weekend? Get out to Hustle & Scout and The Forage at the Fairburn hangers. I’ve just come from there and it is brilliant, food is great, so is the beer, wine and the stacks of really good fashion and design. None of the usual schmuck at these events, this is bona fide quality. Grab the rosemary chips and the buttermilk pancakes at the Pod Food stall. Definitely my favourite. With the Peruvian Food and Pialligo Farm Produce coming a close second. Canberra you really shine, particularly on a gorgeous warm autumn day like today. btw Can we start a campaign to make John Snow Canberra Dictator for Life? Compare what he is doing at the Airport and Brindabella, with what the ACT Government is doing to the rest of Canberra! You missed the fact that this weekend is the commencement of the local ice hockey competition. It kicked off tonight with an exciting C Grade match. Tomorrow the women will be in action against a Sydney team and on Sunday there are 5 matches from 4:45pm onwards. Check http://www.ihact.org.au/schedule for details.